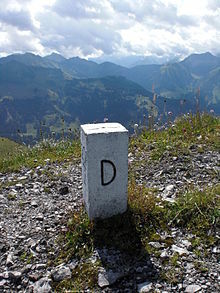 D (named dee /ˈdiː/) is the fowert letter o maist variants o the basic modern Latin alphabet. Seembol "D" is 500 in Roman numerals. The Semitic letter Dâlet mey hae developed frae the logogram for a fish or a door. Thare various Egyptian hieroglyphs that micht hae inspired this. In Semitic, Auncient Greek an Latin, the letter representit /d/; in the Etruscan alphabet the letter wis superfluous but still retained (see letter B). The equivalent Greek letter is Delta, 'Δ'. The minuscule (lawer-case) fairm o 'd' consists o a luip an a taw vertical stroke. It developed bi gradual variations on the majuscule (caipital) form. In haundwritin, it wis common tae stairt the arc tae the left o the vertical stroke, resultin in a serif at the tap o the arc. This serif wis extendit while the rest o the letter wis reduced, resultin in an angled stroke an luip. The angled stroke slawly developed intae a vertical stroke. The letter D, staundin for "Deutschland" (German for "Germany"), on a boondary stane at the mairch atween Austrick an Germany. In naur aw leids that uise the Latin alphabet an the Internaitional Phonetic Alphabet 'd' represents the voiced alveolar or voiced dental plosive /d/, but in the Vietnamese alphabet, it represents the soond /z/ (or /j/ in soothren dialects). In Fijian it represents a prenasalized stap /nd/. In some leids whaur voiceless unaspirated staps contrast wi voiceless aspiratit staps, 'd' represents an unaspirated /t/, while 't' represents an aspirated /tʰ/. Examples o sic leids include Icelandic, Scottish Gaelic, Navajo, Estonie an the Pinyin transleeteration o Mandarin. In Breetish Sign Leid (BSL), the letter 'd' is indicatit bi signin wi the richt haund held wi the index an thumb extendit an slichtly curved, an the tip o the thumb an finger held against the extendit index o the left haund. ↑ Lynch, John (1998). Pacific languages: an introduction. University of Hawaii Press. p. 97. ISBN 0-8248-1898-9. This page wis last eeditit on 3 Februar 2019, at 17:55.